Although the title of The French New Wave- A New Look is somewhat clumsy and almost sensationalist the content is luckily more down to earth. The book is divided into five chapters which forms a coherent overall picture of one of the major stylistic movements in film history. Chapter one is largely concerned with forming an overview of la nouvelle vague (New Wave) ‘and a discussion of what are usually considered its defining traits’ (p.3) before chapter two briefly steps back to identify the ‘intense filmic culture of postwar France’ (ibid.) which enabled the New Wave movement to take shape. Chapter three is focused on an under-represented area- ‘experimental and independent films of the 1950s’ (ibid. )- whilst the final chapter looks at the iconic films of the New Wave before assessing its lasting legacy. Before her book has really got going Greene evidently feels the need to interrogate and justify the very term ‘New Wave’ and cites a difference of opinion amongst even leading critics as to what exactly constitutes a ‘New Wave film’ or even a ‘New Wave director’. In drawing many of these opinions together in a succinct fashion, Greene juxtaposes contrasting views of modern-day critics alongside comment from the undisputed leading lights of the New Wave such as Truffaut, Chabrol and Godard. The one problem in this positioning is that Greene’s own voice does not come through the melee of comment she anthologises, apart from a barely detectable cynicism as to the lasting significance of the movement very early in the book. However, the advantage to Greene’s approach is that she is able to include some very pertinent statistical information gleaned from a variety of sources which prove startling reading. The youthful element behind the New Wave is often referred to, but when one considers that over 160 new directors made their debut feature films between 1959 and the end of 1962 (Marie, quoted on page 5), it become perceivable as less of a movement and more of a revolution. As well as efficiently pulling together the disparate strands of critical thinking relating to the New Wave, Greene’s book also includes reference to the key foundation of scholarly theoretical criticism that underlies the New Wave. In managing to condense the main thrust of these key writings she succeeds on two accounts. Firstly, the relevance to her main focus becomes much clearer, and secondly the elucidation of such theories enables the book to be that more accessible. One example of this is Bazin’s preference for the ‘ontology’ of the image, which is directly linked to Italian Neorealism which, in turn, is correctly anchored to French New Wave. The largest chapter- the third- of Greene’s book treks across the relatively unexplored lands of ‘film experiments of the 1950s’ with a look at specific filmmakers ranging from Melville to Rouch, Varda to Vadim. This is an additionally interesting focus because it posits key names in French cinema who some critics (including myself) do not regard as pure New Wave directors (or, in the case of someone like Vadim, not New Wave at all). However, their inclusion is only partially to raise the debate over the inclusiveness (or perhaps one should say ‘exclusiveness’) of the term ‘New Wave’. Rather, it is to establish the fact that not every director working in France in the late 1950s and 1960s was simply ‘New Wave’- after all, Claude Autant-Lara, a key figure in the ‘Tradition of Quality’ so despised by the Cahiers… critics was still actively directing throughout this period. Thus, although the New Wave can in retrospect be considered the defining cinema of the 1950s and 1960s in France it should be noted that there was far more to French film in this period than the New Wave modus operandi in the same way that there is more to Edith Piaf than Je Ne Regrette Rien. If chapter three represents the surrounding garnish in the French New Wave buffet, chapter four of Greene’s book is both the meat and fish courses combined in its richly layered chronological focus on the key films to emerge from the movement. For me, Greene gets the tricky balance exactly right- too much textual detail and the reader is submerged; not enough- and the link to what has gone before becomes marginalised, obscured. Thus, to take just one key example, Les Quatre Cents Coups is afforded more or less five and a half pages including one still picture- enough for the New Wave credentials to be established beyond any juncture, the level of conveyed information highly focused and appropriate. For any study of the French New Wave the problem persists of exactly when to stop, such is the academic debate over when the movement really came to its conclusion. Naomi Greene neatly side-steps this quandary by shining the spotlight on specific key films before concluding her book with a final chapter (number five) entitled ‘aftershocks’. Here, she briefly summarises the direction taken by New Wave filmmaking after the initial surge (which she calls ‘euphoria’), bringing her book to a tidy conclusion. Yes- there is more to be said; but no- this isn’t really the place to say it. The book ends with a thorough notes section, solid filmography, bibliography and index. Given the major influence and scope of the films made within the stylistic movement familiarly known as ‘the New Wave’, it is a little disconcerting to realise how many key films are either not available on DVD or have received poor releases with minimal significance being given to their makers or the context of their production. Any such list of key filmic texts as Greene provides does more than highlight the titles alone- it shines the spotlight on the fact that, whilst things are getting better, there is more DVD release ground as yet still unfarmed. One film that is available on DVD (be it in two differing versions depending on region-code) is Godard’s masterpiece Bande a Part. On the BFI disc the bonus interview with Raoul Coutard proves interesting viewing, for he comments: ‘but the New Wave, understand, was a creation of the Cahiers du Cinema mafia. This meant that if you started filming then, but had no Cahiersconnection you weren’t New Wave’. This tellingly posits an odd scenario for anyone brave enough to tackle such a key cinematic movement, as technically any such book should not concern itself with those outside the Cahiers… group. However, that a book like The French New Wave- A New Look discusses a variety of filmmakers does underline one key aspect- the New Wave was not a coherent movement with a unified approach. It was, in essence, about young French directors who wanted to put their critical knowledge into practice and, in doing so, revolutionised cinema as we know it today. 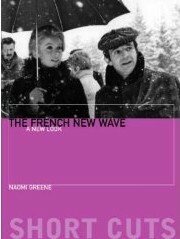 'The French New Wave- A New Look' is published by the Wallflower Press.